Le Velasco: Part 2 - Tired of Shaving??? If you read my previous post I blogged about Epilating, now today’s post is for those who think epilating is too painful and prefer something more pain free that will remove the hair without having to use a razor. I don’t recommend Nair or Mandy’s hair removal creams because a lot of people told me that they had bad experiences with them and when I tried them out, it burnt my skin so badly and it didn’t even remove the hair at all. 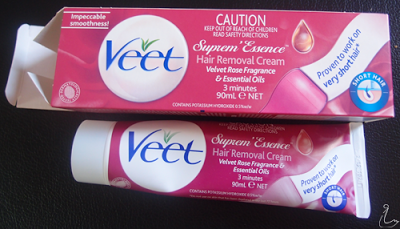 I highly recommend the Veet Supreme ‘Essence Hair Removal Cream so make sure you get this one because I find it works well and it never irritated my skin like the other products have. So how do you do this: Well when you open up the box you will see it comes with a little spatula, so what you do is put some cream on the spatula and rub it on your skin, preferably I do it when my skin is dry but you can do it when it’s wet as well, it works both ways. You don’t want to rub it in completely you just want to smoothly layer it on your skin because you want a thick layer of this. Once done you want to leave it on for a maximum of 6 minutes according to the box. The box does warn you not to go over 6 minutes but I personally keep it on for 8 minutes because I feel it works best if I keep it on for a bit longer. After keeping it on for 6 minutes, lightly remove it with the spatula. Once completely removed rinse your legs and you will instantly feel how silky smooth your skin feel. Please note: It doesn’t really work on coarse hair, so if you someone who shaves a lot and your hair is really thick, it’s not really going to remove the hair but it does soften it so when you shave it does give you a more cleaner shave. 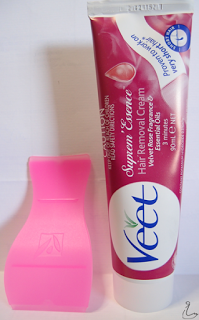 This is a hair removal cream is said to remove hairs from your skin (Legs / Underarm / Bikini) without any cuts or unpleasant depilatory smell but as I said before, for me it only works best on my legs an according to the Veet "The effective blend of essential oils and velvet rose leaves your skin moisturised, touchably smooth and delicately scented. ".